Hillside Cottage is located on the Wild Atlantic Way in the village of Shraheens, just over one mile from the main business centre of Achill - Achill Sound. Shraheens is a quiet country road, with beautiful views across the Sound to Currane mountain on the mainland on the one side and the low-lying hills which gave the area it's name on the other side. We feel that our quiet location in the southern and less touristy part of the island has fantastic benefit for those interested in truely exploring Achill's diversity and beauty, particularly those interested in sightseeing while cycling or walking. It is also well placed for access to supermarkets and other services, and is very close to the entrance to Achill, making it a great base for guests who wish to explore outside of Achill on occasional days during their stay here. At only two miles * to the start of the Greenway, it is the ideal base for guests who are arriving by bicycle from Westport. * see below re coming soon new Greenway section!!! If you turn right when you leave Hillside Cottage, this road through Shraheens continues on to Bleanaskill, Derreens, Kildownet and into Cloughmore. This route through the southern part of Achill is a fantastic area for cyclists to explore, with beauty on all sides and little traffic. There is the option to travel on to Achill Beg or Clare Island from Cloughmore or to take a fishing or boating trip from there. The road leads on from Cloughmore to the Atlantic Drive, which is the original "Wild Atlantic Way" of Achill, with unrivalled views and, in the wilder months, spectacular crashing waves. From the end of the Atlantic Drive you can go right to come back through Ashleam to emerge on the Shraheens road only a 5 minute walk back to Hillside Cottage; or you can go left to continue into the quiet fishing village of Dooega. From Dooega you can take the road up to Minaun Heights to experience viewing the whole of Achill from this spectacular vantage point - though not the easiest route to cycle! If you go left when leaving Hillside Cottage, you come back to the T-junction where you first turned left on arrival. Going right here brings you into Achill Sound. Turning left brings you down the island towards Keel. In Achill Sound, just over one mile from Hillside Cottage you will find grocery and food stores, hardware stores, newsagents and pharmacy. The library, health centre and main tourist office are located here, as well as a post office, church, hairdressers, beauty salon and souveneir and craft shops. There are a choice of places to eat and drink. Greenway News for Hillside Cottage guests in 2019! The new section of the Greenway is opening soon, just half a mile from Hillside Cottage! This new section joins to the Westport - Achill section in one direction and in the other direction to the latest section heading into lower Achill, through beautiful Springvale and Saula and emerging at Teds Pub and Cafe in Cashel. Soon... you can be on the Greenway from the cottage in just five minutes! 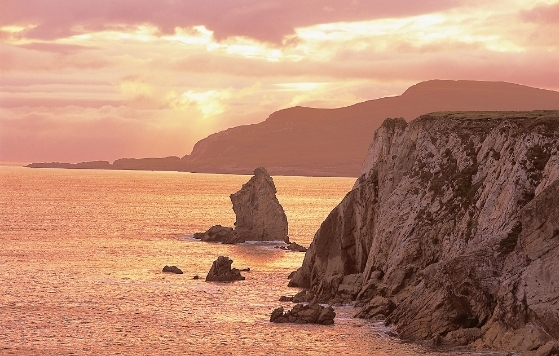 Achill is 45 to 55 minutes drive from Castlebar. To get to Achill take the R311 (Castlebar) or N59 (Westport) as far as Newport , then the N59 as far as Mulranny, then the R319 into Achill. You do not have to go through Westport to get to Achill - to do so would lengthen your journey if you are already in Castlebar. Coming from Dublin or Sligo direction you will come into Castlebar on the N5. Coming from Cork, Limerick or Galway direction you will come into Castlebar on the N60 or N84. From the Dublin road N5: at first roundabout take 2nd exit, at next roundabout take 2nd exit, at next roundabout take 2nd exit, at next roundabout take 1st exit, at next roundabout take 1st exit, go left at the T-junction at the lights. Straight ahead from there. From the Galway road N17/N60: after Breaffy at first roundabout take 1st exit, at next roundabout take 1st exit, straight on to T-junction at lights, go right, at next roundabout take 1st exit, at next roundabout take 2nd exit, at next roundabout take 1st exit, at next roundabout take 1st exit, go left at the T-junction at the lights. Straight ahead from there. From the Galway road N84: come in past the railway station and through lights, at first roundabout take 1st exit, at next roundabout take 2nd exit, at next roundabout take 1st exit, at next roundabout take 1st exit, go left at the T-junction at the lights. Straight ahead from there. If you are coming from Westport direction, you do not have to go over to Castlebar first: simply take the N59 (straight ahead from the bottom of James Street) towards Newport. From Castlebar: When you come to the T-junction after going under the arched bridge (with Newport House in front of you), turn right to go along main street. From Westport: Go straight along the main street after coming over the bridge. Stay on the N59 towards Achill. You will come into Mulranny. At the end of this village, stay left on the R319 towards Achill (the N59 turns right here for Ballycroy and Belmullet). Take care not to take the "coast road" which is the left turn just before the R319... unless you want a longer scenic route. You know you are in Achill when you come over the bridge with the white arches above. Welcome! You have arrived at your destination! We wish you an amazing holiday! Directions to Hillside Cottage will be provided with your booking confirmation.